In our countries, we see Iran as an exotic area, far away from our (narrow-minded) (capitalistic) ideas and thoughts. But their musical scene, well, is not known. I do know some hands full of bands / projects (often anonymous, cf. religious fundamentalism – no further comment) that dwell within the (Black) Metal scene (and hey, there are some truly underestimated yet worthy and excellent recordings from Persian soil! ), yet there is a small / vivid (delete as appropriate) Ambient / Experimental / Drone scene too. I want to refer to the compilation Visions Of Darkness (In Iranian Contemporary Music), released in early Autumn 2017 and reviewed by undersigned (see: http://www.concreteweb.be/reviews/various-artists-visions-darkness), or its predecessor Persian Experimental Underground 016 Survey (not reviewed on this webzine). 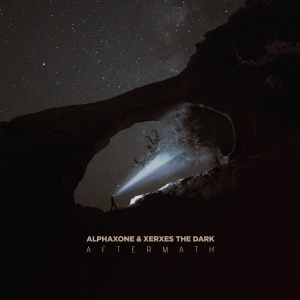 And I can also refer to Cryo Chamber, a label that did release several recordings in the meantime by two excellent and famous one-man projects from Iran, Alphaxone and Xerxes The Dark (both of them contributed on that Visions Of Darkness … compilation, by the way). It might seem ridiculous to dissect each single title, for Aftermath must be seen as the aural representation of one huge event, one precarious exploration into the unknown, as a whole. There is lot to experience, with serene reverberating excerpts, excited and agitated passages, desolate waves, pulsating heaves, and obnoxious, dismal moments of discomfort. In its totality, Aftermath defines an aural exploration; it stands for one majestic cinematic concept that fascinates the whole of the time. Those trusted with the label, or with both projects involved more specifically, will adore this grandiose adventure (once again)!